The Altera DE2 board is the newest education evaluation board that they offer. It has tons of peripherals to play with and easily programmed. This tutorial goes through the basics for setting it up. NIGDE UNIVERSITY of turkey.I m studing electronical engineering on licence level. 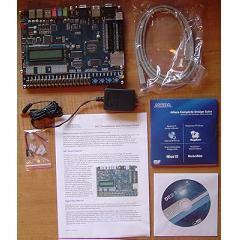 May u help me about using Altera DE2-70 board for testing some projects. I need a few projects that written with VHDL. Pls help me ..I m looking for ur reply.. I watched the Altera de2 board 4 University FPGA Projects,it was good but i need the code written in verilog.so kindly please upload the project in verilog version also..